This article deals with improving the design of the solenoid driver / voltage regulator boards used in Bally and Stern pinball machines from 1977 through 1984. There are basically two "weak" spots in the design of these boards. Each will be covered separately below, along with individual modifications. The 5 volt regulator circuitry on the solenoid board requires a lot of current, but only has one single pin with small gauge wire for each of the positive and negative lines between the solenoid board and rectifier board. This is a huge bottleneck, and is the cause of connectors scorching and burning up on both the solenoid driver and rectifier boards. To modify this circuit it is necessary to provide a better (larger) path to ground from the 5vdc regulator circuitry. The only pin originally designed for ground return from this circuit is in connector J3, pin 10. This pin is commonly scorched, and sometimes the whole connector housing is burned or broken in half at this point. To make a better path to ground, a jumper wire is installed between the negative lead of the C23 filter capacitor and any of the block of multiple ground pins at connector J3, pins 18 through 22. These pins all lead back to chassis ground on the rectifier board (as well as the original line at pin 10), so this modification essentially "widens" the ground path for the 5vdc regulator circuit. While making this modification, it is STRONGLY recommended that you replace your C23 filter capacitor, if it appears to be an older, or original part. This is a common failure part on this board, and is the main cause for games going "dead", operating intermittently, or resetting during operation. We replace the C23 capacitor on ALL of the older Bally and Stern games (1977-1985) that come through our shop- along with fixing bad connectors and doing the modifications described in this article, it is the only way to make this circuit reliable and ensure better game operation. NOTE: We have a C23 Capacitor Kit available, along with other associated electronic parts and connectors. Click here for more information and online ordering. Late Boards: Late Bally boards have a wide ground trace that runs right below the negative plate-through hole for the C23 capacitor, when looking at the board from the back side (solder side). 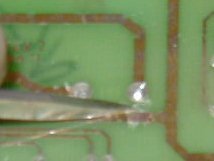 To make the modification, scrape off a small section of coating over the ground trace, right below the negative lead for the C23 capacitor. Then install a short jumper wire (or even solder wick) between these two points. Modification complete. Early Boards: Early Bally boards did not have a ground trace that was as conveniently located as the one on later boards, so for early boards, simply install a longer jumper wire on the back of the board between the negative point of the C23 capacitor and the ground pins 18-22 on the J3 connector. We recommend using a heavier wire for the jumper wire- 18 or 16 gauge wire is fine. Solenoid Board Connector: It may be necessary to replace the J3 connector on the solenoid board- the whole thing. This is more likely the case in later (1981) Bally games, as they used the low-quality IDC "press-in" connectors, where wires were simply pressed into the connector without soldering or crimping. These connectors, when burned, will get brittle, and usually break right in the middle. Earlier games used the older-style "crimp and solder" Molex pin housings, which are much higher quality. These are the types that we recommend for replacement. Rectifier Board Connector: We also recommend replacing the connector pin for the positive lead down on the rectifier board. This pin is at connector J3, pin 8, and is a small gauge orange wire. We recommend replacing the connector pin in the housing at this location with a higher-quality Trifurcon pin, and properly crimping and soldering it to the wire. Make sure also that the header pins at these connectors on both boards are clean- they may be oxidized or scorched from problems in the past. Power (positive) comes from the rectifier board at connector J3, pin 8 (J3-8), in a small orange wire. This wire connects to the solenoid board at connector J3, pin 12 (J3-12), and usually burns/scorches at J3 on the rectifier board. 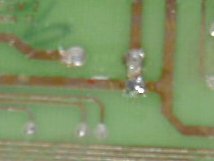 Ground (negative) comes from the rectifier board at J3-17, in a small white wire with brown trace. This wire connects to the solenoid board at J3-17, and usually burns/scorches at J3 on the solenoid board. Current for the logic buss in the solenoid driver circuitry on the solenoid driver board is supplied from the 5 volt regulator circuitry on the same board. However, for some unknown reason, the path for this current is actually routed off the board, in the J3 connector, then back into the board, also through the J3 connector. 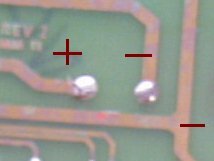 Essentially, there is just a small "loop" or jumper wire in the J3 cable connector housing where this path leaves the board, then comes back- specifically, between pins 13 and 25. This path basically connects the two test points TP1 and TP3 together. The problem with this design is that if any poor connections develop in the J3 connector (dirty connector pins, scorching, or burning), or if any solder joints on the backs of the pins develop cracks (common in older pins), then the driver buss won't have it's full share of current (or no current at all), and this can cause coils to either cut out altogether (die), or can cause some coils to operate sluggishly. To modify this circuit, simply solder a jumper wire between TP1 and TP3. This can be done on the top side of the board, or on the back side, to hide it, and keep it looking neat. This added jumper connects the driver buss to the regulator output directly, and bypasses the factory J3 connector "loop". This modification simply provides better reliability for the coil driver circuitry. Problems don't occur with it often, even on un-modified boards, but if they do, it's better to be covered, and this is a quick, easy modification to make, especially while you've got the board out of the game. IMPORTANT NOTE: Be sure NOT to mistakenly connect TP5 instead of TP1. 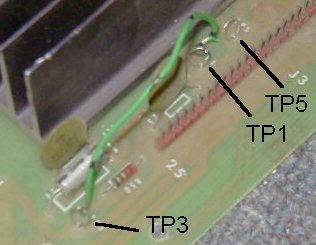 TP5 is located just above TP1 on most Bally boards, and if you connect TP5 instead of TP1, then you will be sending unregulated 12vdc (13.5-16.5vdc) down the 5vdc line which can destroy components and chips on ALL of the boards in the game. Be sure to ONLY connect TP1 and TP3. NOTE: Test point locations can differ from the above photo, depending on what revision Bally board you're working on. They're also in different locations on the various Stern boards that were produced over the years, so don't go by the picture alone- be sure to identify and connect the correct locations on your particular board.